The EUR/USD extends its gains after Draghi's not-so-dovish Draghi and weak US inflation. The US consumer is at the center of attention today. 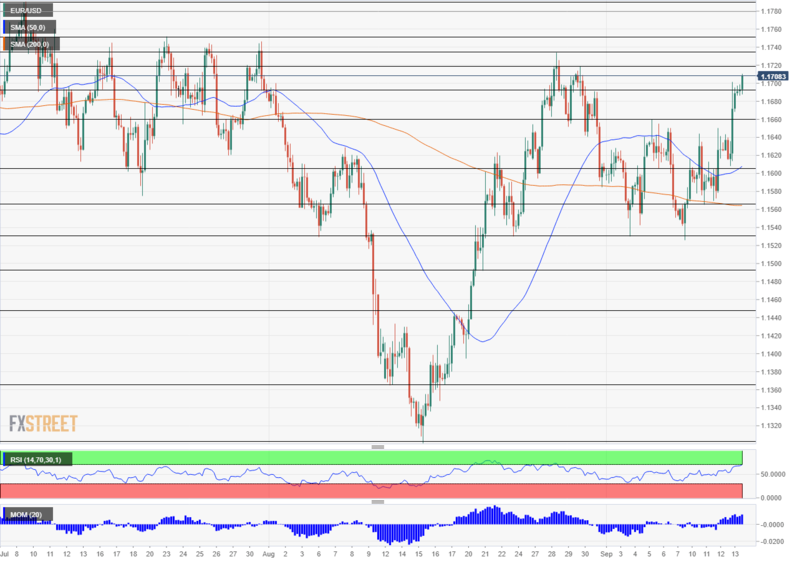 The charts show that the EUR/USD is close to overbought conditions. The EUR/USD is on the rise once again, trading above 1.1700. The move today is a result of the all-important event on Thursday. The European Central Bank made no policy announcements on the eve of QE tapering. ECB President Mario Draghi was quite upbeat in the press conference. He described risks as balanced, stressed upside risks such as rising wages, and did not downgrade inflation forecasts despite a recent slide. A second factor pushing the Euro higher came from Turkey. The Eurasian country's central bank hiked interest rates to 24%, above market expectations, and provided some stability, defying the will of the President. Turkey has close trade ties with the euro-zone and has a customs union with it. The advance of the EUR/USD is also due to the weakness of the greenback. US inflation figures disappointed in August with the Core Consumer Price Index decelerating to 2.2% against 2.4% in July. While the Fed remains firmly on course for a hike, the path forward is somewhat more cloudy. Another top-tier event awaits the US Dollar today: Retail Sales. A slower growth rate is on the cards for August after a robust rise in July. The University of Michigan's preliminary Consumer Sentiment gauge for September will have the last word of the week. Contrary to the Conference Board, UoM has shown a drop in confidence in August. The upswing in the pair and the fall of the greenback are also due to the most significant theme in markets, or the lack of news in that front: trade wars. The US has not imposed new tariffs on China and took a different stance. US Treasury Secretary Steven Mnuchin has initiated talks with the world's second-largest economy. The move cheers markets and diminished demand for the safe-haven USD and JPY. However, it is unclear if Mnuchin has the backing of President Donald Trump. Trade headlines may steal the show from the data later in the day. The EUR/USD broke above the narrow range it traded in and has reached the highest levels in over two weeks. Momentum on the four-hour chart points to the upside. The Relative Strength Index (RSI) is currently on the verge of 70. A move above this level places the pair at oversold conditions. 1.1720 was a temporary high in late August. 1.1735 was the peak in August and is a more significant line. Further up, 1.1750 was a quadruple top throughout July and is a substantial line. Also above, 1.1795 was the high point in July, and 1.1850 capped the pair in mid-June. 1.1695 held the EUR/USD down in late August. Lower, 1.1660 was a resistance line in early September and now turns into support. 1.1605 was a swing low just before the recent rise. 1.1565 cushioned the fall of the pair this week, and 1.1530 is a triple bottom.